Each product or service within your salon has a gross margin, which is the difference between the selling price and the cost of the product. The gross margin is used to calculate the gross margin percentage. This salon gross margin percentage calculator will help you to estimate the gross margin percentage of your products for use in the Financial Projections Template. If your business has multiple products then use the calculator for each product and then average the margin using our weighted average gross margin calculator. The Excel sheet, available for download below, helps a salon calculate the gross margin percentage for up to three products at a time. The calculator is used by entering the selling price of the product together with the sales tax rate. The supplier list cost price of the product is then added together with any trade and retro rebate discount percentages allowed. Finally, the calculator allows for selling costs such as staff commission and franchise turnover fees, together with a shrinkage percentage to be added. The salon gross margin percentage calculator will provide the gross margin percentage, markup percentage, and retail price to cost ratio for each product. 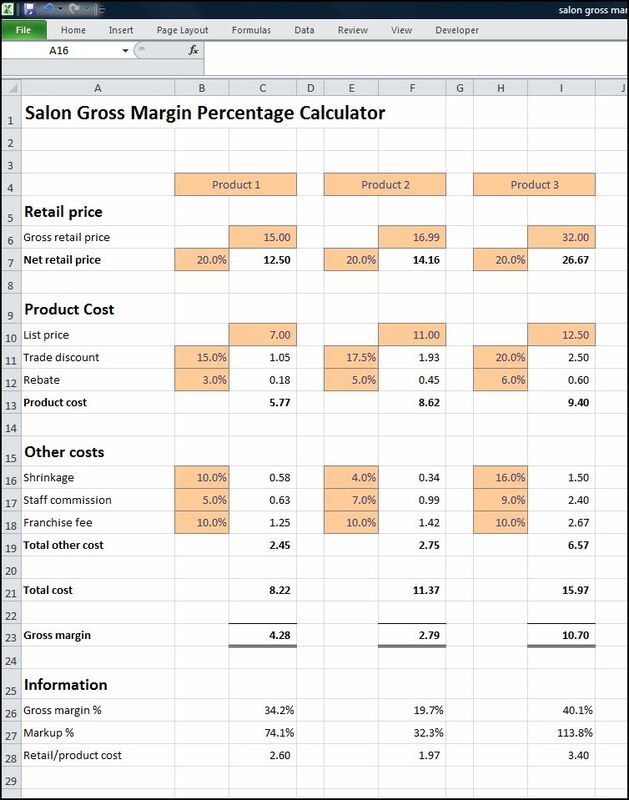 The salon gross margin percentage calculator is available for download in Excel format by following the link below. Users use this salon gross margin percentage calculator template at their own risk. We make no warranty or representation as to its accuracy and we are covered by the terms of our legal disclaimer, which you are deemed to have read. This is an example of a salon product margin calculator format that you might use. It is purely illustrative. This is not intended to reflect general standards or targets for any particular company or sector. If you do spot a mistake in the salon gross profit calculator template, please let us know and we will try to fix it.